Chances are, if you're obsessed with makeup, not only have you already heard of the new Viva Glam lipsticks, but you're tired of it being mentioned. 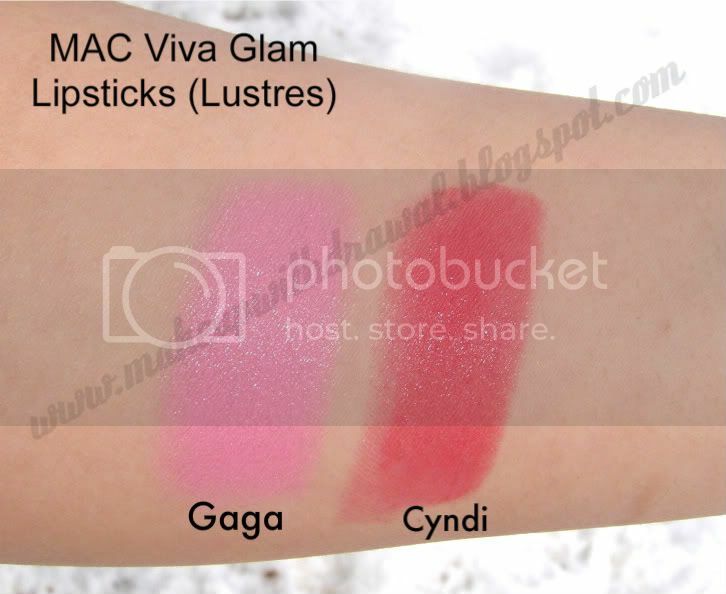 But for everyone else, let me introduce to you the two newest additions to MAC's Viva Glam collection, VG Gaga and VG Cyndi. That's right- two of the most interesting woman on our planet now have luscious colors housed in black bullet lipstick cases worthy of them. I'm a huge fan of both, and even if I wasn't, these colors are still simply divine. VG Gaga is a bright bubblegum pink- though sheer and buildable, (both lipsticks are Lustres) it is a bit on the cooler side. Don't let that deter you though! I'm quite neutral and I can still pull it off. It's my belief that Viva Glams are formulated so that they are appealing to the most number of women possible. VG Gaga is similar to MAC's Saint Germain (Saint Germain is bluer) and in an interview with Marie Claire, the pop icon herself mentions that it's inspired by the lipstick she used to wear (but modified to suit her tastes), Pink Nouveau. VG Cyndi is my favorite- it's a beautiful strawberry that's incredibly versatile. I'm becoming more and more infatuated with each use- and I have to admit that this is my first sheer coral red lipstick. I'm kind of a bold red lip hoor, for me it's opaque or nothing. However, this color is so glamorous in so many ways, I've worn it with 4 different styles of application so far and loved them all. These lipsticks are definitely something you'll want to pick up- they're so immensely popular that VG Gaga is temporarily sold out on the site. Have no fear! Though limited to a year, they will be restocked soon at your nearest MAC counters.